victory, and the majesty. Everything in the heavens and on earth is yours, O LORD, and this is your kingdom. We adore you as the one who is over all things” (1 Chronicles 29:11, NLT). 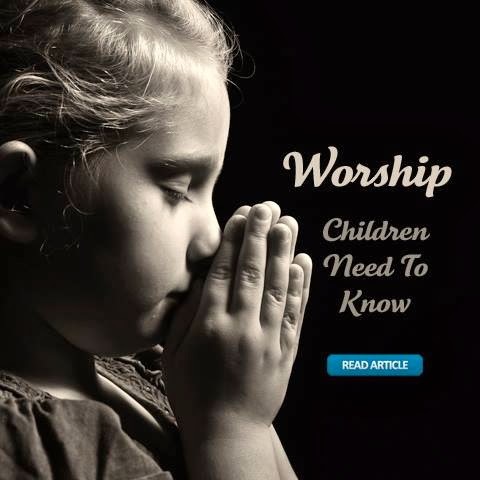 Children wonder, “Why bother with worship?” Many kids understand very little about the purpose of worship. During worship services they often center on themselves, bore easily, and expect to be “entertained.” Kids lose sight of the fact that God is the primary audience who deserves their praise! Children are natural worshippers. They gaze in wonder when entering a theme park, marvel at a simple bird nest, or rush to get autographs of a celebrity or sports hero. With intentional cultivation, a child’s unashamed joy in response to those events can also be turned toward God. Kids can learn to focus their entire attention on the Lord’s greatness! God desires adoration and sincere praise. After Moses and the Hebrew nation crossed the Red Sea and witnessed God’s miraculous help, they sang a song of deep praise and thanksgiving (Exodus 15:1-19). David learned about God during many days with the Lord as shepherd, fugitive, and king. He often responded to God with deep appreciation and excited exaltation (2 Samuel 22, Psalm 27). When we see the Lord display His character and learn to relate to Him personally, our heart naturally responds in worship. During a week-long summer camp, more than 200 kids and counselors gathered each night to sing, watch skits, and hear the word of God. A young worship leader (with a silly camp name) led everyone with high-energy songs as well as slower-tempo praise songs. Each day we built upon our skill as worshipers. Three days into the week, he led a longer worship section, intending to use the momentum of the camp setting to create an extra special night of worship. The night began with high-energy songs with hand motions, movement, and loud singing. Scriptures set to catchy tunes, swaying, and goofy acting raised such delight and laughter that every child was filled with joy. Then the worship leader told a story. He described a childhood gift he gave to his mom, a simple popsicle-stick creation. In spite of the gift’s meager craftsmanship, his mother responded as if she had received a precious, valuable present! His artwork was displayed prominently in the house and proudly shown to visitors. Our leader asked, “The gift was so plain. Why did my Mom love it so much?” —The item was valuable to his mother because he, her special son, had given it! Next, the worship leader connected his story to worship. Just like his mom, the Lord enthusiastically receives each gift of praise. God doesn’t demand perfect words, pitch, or harmony—simply a heart motivated by love. The leader challenged the kids to focus on Jesus, and give the Savior heartfelt praise! As the students began to apply this, the atmosphere shifted from silly to sweet and heartfelt. Counselors and kids alike connected with the God of the universe as they gave Him simple expressions of thanksgiving and words of appreciation. Some counselors were brought to tears by the sincere worship from a group of third grade boys who previously had focused on pranking cabins and catching lizards. A sense of peace and reverence permeated the woods that night as the children practiced sincere worship! “Out of the mouth of infants and nursing babies you have prepared praise” (Psalm 8:2, ESV). Imagine an elaborate birthday party with fancy streamers, a beautiful cake, and long guest list. Now imagine that same party where the attendees paid zero attention to the guest of honor. People mingled and conversed together but never celebrated with the birthday boy or girl. The attendees opened gifts and kept them for themselves. They totally ignored the guest of honor. This scene would cause unthinkable hurt and sadness! Are we not sometimes guilty of the same neglect when it comes to church worship? We thoroughly enjoy the pastor’s presentation of God’s Word, the beautiful music, and stimulating fellowship with each other—that we forget to honor the focal point of the “party”—God Himself. He who created all things and in Whom all things hold together (Col. 1:17) desires and deserves our wholehearted worship. God created us to praise and celebrate Him. Worship emerges as a natural response to understanding who God is. Children should not have to muster up insincere emotions or fake their way through a worship service. Daily choices help fuel genuine responses of praise to the Lord. Begin with thankfulness (Psalm 95:1-2, Colossians 3:16). Gratitude softens the heart and centers our focus upon God’s character. When we thank God, we see Him and our circumstances more clearly. Learn about God’s character (Psalm 47, 145). A shallow understanding of who God is and what He is like leads to superficial worship. Deep understanding of God’s qualities opens the door to wholehearted worship. Cultivate a deep relationship with God (Jeremiah 29:12-13). As we build trust and closeness through prayer and personal Bible study, worship flows from a deepening friendship. Choose to worship (Psalm 103:1-5). David often commanded his soul to “bless the Lord.” We too can exercise faith and volitionally choose to praise God. This prevents our heart and emotions from leading us astray.